Hi, Hey, Hello! It feels like forever since I've put a post up. Unfortunately, Monday's post was short lived due to a shortage of the product in stores, but it will be back in July! Today I'm talking twist front tops under $50. Twist and knot front detailing is all the rage right now and there are so many amazing affordable options. Tank, short sleeve, long sleeve, ruffle sleeve, 3/4 sleeve... you name it, it probably exists with a twist front at a great price! 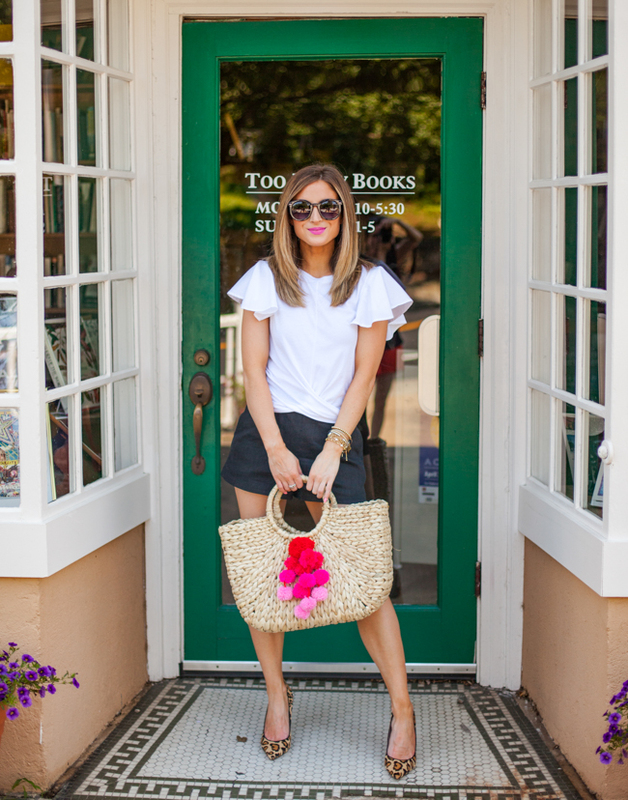 The ruffle sleeve twist hem top I'm wearing in today's post is actually under $30! I love the ruffle sleeve detailing so much - it's hard to tell but it's actually a different texture than the rest of the top - and they fall just right on the shoulders. It wears really well with these black linen blend shorts (they are only $49 and come in multiple colors!). I love the length because you can easily dress them up or down depending on the occasion. And for a pop of color and pattern, some leopard pumps and a pink pom straw tote! Oh, my sunglasses are a dupe for my go-to pair. They look almost identical and are less than $10!